Via Gazete Manifesto (Translation from Turkish) – This week, another boat carrying refugees drowned in the Aegean between Sivrice Burnu (Çanakkale) and Lesvos. 16 people died and only two people survived the shipwreck, they are now on the island of Lesvos. 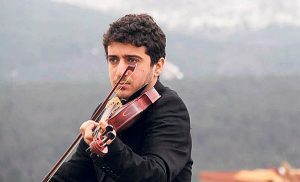 On board of the ship was also a young Turkish violinist – Barış Yazgı, 22 years old, born in Siirt – who wanted to go to Belgium – where his brother lives – to study music. His dead body was found hugging a violin box. Inside his violin box he carried his instrument as well as handwritten compositions. According to Çağdaş Ulus from Vatan Newspaper Barış Yazgı was living in Istanbuls district Fatih together with his brother Cengiz who as well is a musician. Seven month ago they went to Belgium together but Barış had to return to Turkey when his visa expired. Unemployed and insecure, he applied for another visa but got rejected twice. So he decided to take the dangerous journey through the Aegean. He worked and saved up in order to pay the required money for the trip. His plan was to go to Lesvos first, and continue from there to Belgium. His friends said that his only dream was to go to Belgium and attend music school to become a virtuos violinist. His musical friends and family attended the funeral, which took place yesterday in Fatih Kozlu Gasilhanesi.